In the previous post, we talked about service discovery and how it become an important component of modern environments, and we tried to set up a Consul cluster and to register/deregister a python application with Consul and saw how to use Consul-template to update the configuration for the load balancer to include new app server. The problem with the previous setup is that every service in the environment has to find a way to register itself with the service discovery tool, this will be very painful and hard to maintain if you are working with multi-tier systems with multiple services. In this post I will use a new tool (registrator) to decouple the registration part from the service, and will use Docker Swarm and Docker Compose to set up a cluster of Docker daemons and automate the setup. Registrator is yet another great tool developed by Jeff Lindsay, it uses the ports published by Docker containers and its metadata to register them with multiple supported service discovery tools like Consul, etcd, and SkyDNS 2. Registrator waits for new containers to run and register them based on their published ports and a set of environment variables that represent the container’s metadata, also it will remove the container from the service directory when the container dies. Check out the main repository, for more information on Registrator. Docker swarm is an orchestrating and clustering tool for Docker that will set up a cluster of Docker daemons on different hosts, they achieve that by using a service discovery backend to be aware of the registered daemons, swarm supports multiple backend including Zookeeper, etcd, and Consul which we will use in our example. The Swarm hosts will be managed by using swarm manager which can be any machine that can reach the service discovery backend that manages the cluster and the Docker daemons on different nodes. For more information about Docker Swarm. The point of adding more tools to the setup is to add more automation and production sense in building a fully distributed system powered by Docker. Three cloud instances, each machine has Docker 1.6.2 installed and listening on both unix (/var/run/docker.scok) and tcp socket (tcp://0.0.0.0:2375). Three Consul Docker containers that will run on the hosts where there ports exported to public interface of each machine in order to be managed by Swarm manager later. Each Docker will register itself with consul using swarm tool, which will run also as a container on each host but will be removed after registration. The Registrator Docker container which will be responsible for registering the Docker containers with consul and deregistering them if they die. Two python app containers which we created in the last post, the two containers will be registered automatically with Consul using the previous created registrator container. On the second host i will install Nginx also using Docker (different from the last post) and will run consul-template along with Nginx to make sure that it’s updated when a new app is added or removed. I will be running Swarm manager on my own laptop which will communicate with any of the consul hosts to query the swarm hosts and be able to launch container on the cluster. 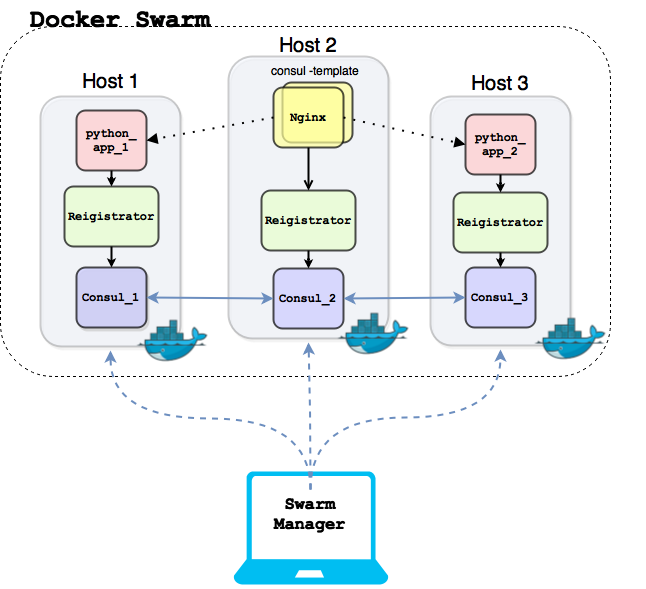 In order for the swarm manager to communicate with the swarm nodes, The Docker daemons and consul will be publicly accessible, this is not a scenario for a real production environment, in a real production environments TLS authentication must be enabled on Docker daemon and also between the manager and the service discovery backend. Enough explanation, let’s dive into building the setup. The label is used by Docker swarm to run a Docker container on specific host this enables the filter feature for Docker swarm. The swarm manager can be any device that can reach the Docker nodes and the Consul backend, and as mentioned before for the sake of simplicity we won’t discuss using TLS authentication for communication in this example, which is a must if you are willing to do similar setups in real production environment. This is awesome! I can now create, start, list, stop, and remove containers directly from my laptop. Now let’s explore how to start our application using registrator. since there is no need now to login to each server and start the desired container, we will start the containers from one place, here we will use the labels that we used to start the Docker daemon as filters on which container will be running on which host. Well that’s seems complicated, let’s figure out what this command do exactly, first it connect to the swarm manager using -H tcp://localhost:2375 and then it runs the registrator container but with a very important environment variable -e “constraint:role==app_1” which if you recall is the constraint we add on node1 which means this container must be created only on node1, and finally it specify the consul target consul://$NODE1:8500 which it will use later to register the docker containers. This will run a standard nginx container with port 80 exported, which will also be registered with consul, the /etc/nginx/conf.d directory is exported as a volume because it will be used with consul-template container to deploy the template there. I will be using avthart’s consul-template image to run the consul-template tool, but before running the consul template container, the nginx.ctmpl file which we created in the previous post will be put in /tmp/ directory into the the load balancer machine. -template="/tmp/nginx.ctmpl:/etc/nginx/conf.d/default.conf:/bin/docker kill -s HUP nginx"
Yeah, thats a very long command but it’s really simple, it will run the container and will use the same volumes of the nginx container and specify the consul target to and it will keep checking every 5 seconds and finally will specify the template which will be the /tmp/nginx.ctmpl file and if any changes happened to the “Python_app” service it will reflect on the configuration of nginx container. Creating a new python_app container using the swarm manager. The container will be created on the specified node. Consul-template container on the lb node is regularly checking for new updates on the “Python_app” service, it will update the nginx configuration file which is shared between consul-template container and the nginx container. 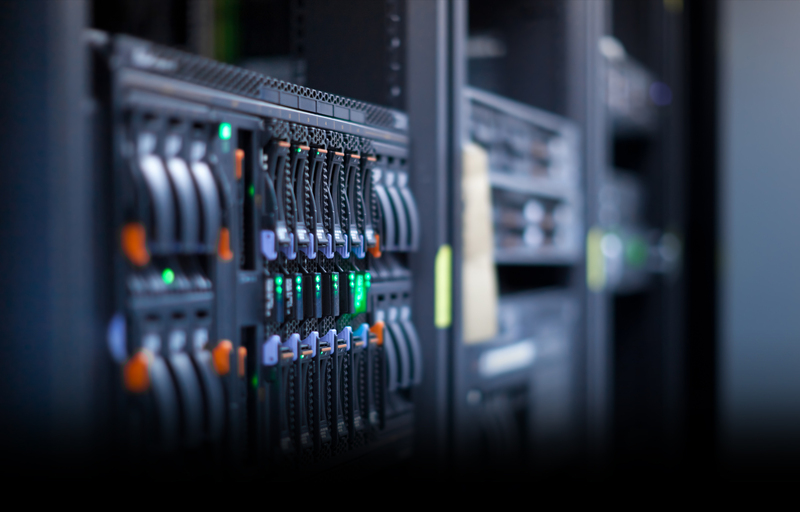 Nginx container will add the new container to the pool of backend servers. Building a functional distributed systems is not an easy job, it requires a lot of work and concentration to get it right, a different tools and components can be used together to build it like we’ve seen in this post. In the following post we will try to use Docker Compose to automate the build of this distributed system and hopefully to simplify the whole process.